Using Ultralight Planes To Drop Drugs Mexican drug traffickers have gotten creative by using small aircraft to drop marijuana into the U.S. The number of ultralights illegally crossing into the U.S. nearly doubled last year, when agents recorded 228 cases. But the newest method to smuggle drugs across the border is especially dangerous. They've used tunnels and boats, and now Mexican drug traffickers are getting more creative. 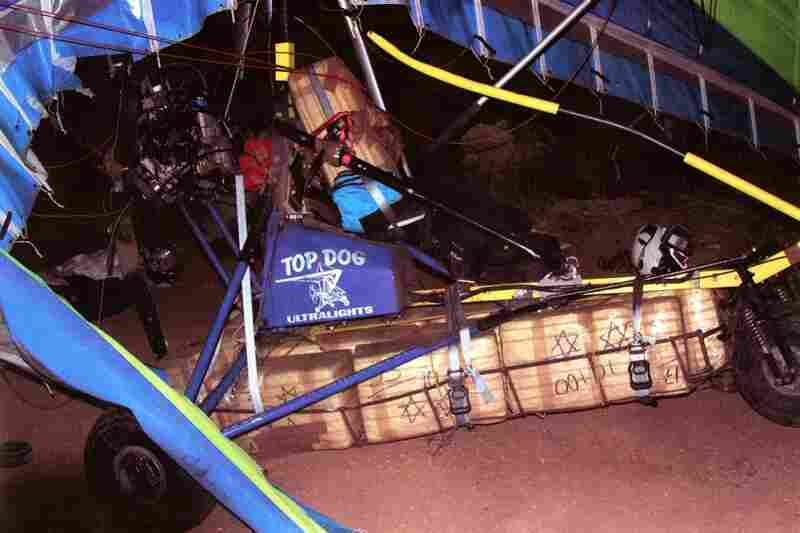 Smugglers are using ultralight airplanes to drop a few hundred pounds of marijuana at a time into the United States. It's just one more method in a smuggling portfolio that appears to be expanding as pressure increases on the ground from American law enforcement. In the hilly desert terrain outside of Nogales, Ariz., Kevin Kelly stands with his back to the wind as the moon glows above the mountains. He runs the local Immigration and Customs Enforcement office. "Right now you're in one of the key marijuana smuggling corridors in the country," he says. To fly this aircraft at night, overloaded, in inclement weather, you've opened up an envelope for disaster, regardless of what it might be carrying. It turns out that marijuana is more likely to be smuggled in the air. The federal government says the number of ultralights illegally crossing into the United States nearly doubled last year, when agents recorded 228 cases. Kelly says the pilots often fly on one seat, exposed to the open air. That seat is attached to a glider wing and an engine. With about three gallons of gas in the tank, their range is no more than a few dozen miles. "The ultralight sounds like a faint lawnmower, and [the noise] gets stronger and stronger as it comes toward you," Kelly says. Legitimate pilots like Denny Reed aren't really thrilled with the concept. "To me, this feels like sitting on top of a flagpole," Reed says. Reed is standing in front of his own one-seat ultralight. He says the aircraft is completely safe in the right hands. But ultralights are like mosquitoes in the wind. And flying low over desert canyons and power lines is a completely different story. "To fly this aircraft at night, overloaded, in inclement weather, you've opened up an envelope for disaster, regardless of what it might be carrying," Reed says. Back in Nogales, Police Detective Nick Acevedo marvels at the drug smugglers' ingenuity and the risks they're willing to take. "Pilots have a lot of guts," he says. "You know, how they can come in and successfully drop 280 pounds of marijuana basically on somebody's lap." At least two ultralights loaded with pot have crashed in Arizona. 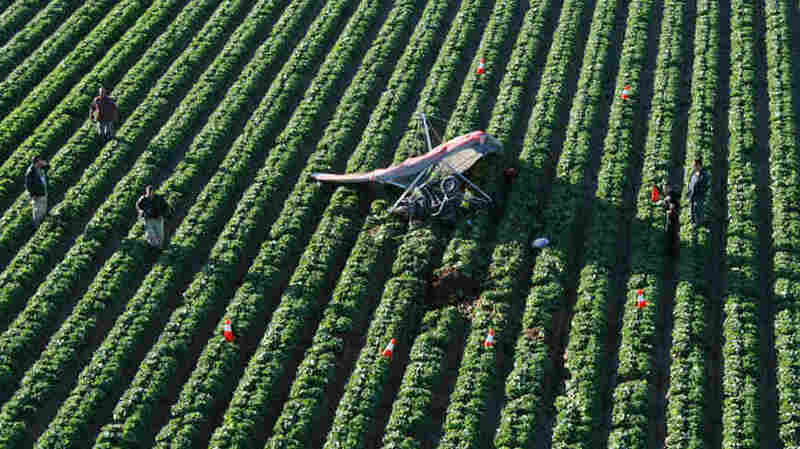 A few years ago, one did a deadly pirouette into a lettuce farm, leaving the pilot's body twisted in the wreckage. Since 2009, Arizona agents alone have seized 10 aircraft and about 11,000 pounds of pot — a drop in the bucket. Federal agents seized an ultralight along the U.S.-Mexico border near Tucson in December 2008. Smugglers had 253 pounds of marijuana onboard. "They have this diversified portfolio. And this is their high-risk stock. If it pays off, great," says ICE Deputy Special Agent in Charge Joe Garcia. He says traffickers are happy to take the risk. For delivering a package in the desert worth $160,000, a pilot might go home with $2,000. So ultralights are cheap, and getting more popular. Due west of Nogales, in El Centro, Calif., agents have logged at least 30 cases, nearly all of them in the past several months. Garcia says late last year, the San Diego area recorded its first ultralight incursion. Beefed up border fences in California have forced traffickers to adapt. "We've driven them underground with tunnels," Garcia says. "We've driven them out to sea. And now they're in the air. Why not try different things?" And that's the consistent message from federal agents. Ultralights bring in just a few hundred pounds of pot at a time. For now, that method works. And it's proof that even illegal businesses look for ways to diversify.